Niramaya Health Foundation is a community-based health services organisation in Mumbai, committed to improving the health of the communities it serves. Niramaya’s twin missions are a) to fight for an anemia-free world for children and b) to sensitize adolescents on their reproductive rights and their sexual health. At present, Niramaya serves children and adolescents residing in urban poverty pockets in the western and central Mumbai upto the city of Thane. Niramaya also works with tribal communities in Pune, Surat, Delhi, and in the states of Uttar Pradesh and Rajasthan. The organisation has 2 clinics in Mumbai and 3 mobile vans to reach out to tribals. Niramaya runs a malnutrition programme which caters to 200 plus Balwadis (schools). Requisite training is offered to teachers in these Balwadis regularly to retain the quality of services. Niramaya is an initiative of Pratham Mumbai Education, one of the largest NGOs providing quality education to underprivileged children. Niramaya received financial support until FY13 from Pratham. Post the financial turmoil, inflow of donations declined for Pratham and thus affecting Niramaya too. Niramaya receives no funds from the parent organisation (Pratham) and is now expected to raise funds on its own. Subsequent sections of this report will elucidate Niramaya’s effort to become self-sustained. Committed staff and delivering quality work at grass roots level differentiates Niramaya from other community-based health services organisation in the areas covered by Niramaya. The organisation has 45 women workers. Glenmark and GlaxoSmithKline, two large pharmaceutical companies of repute has join hands with Niramaya as a part of their CSR initiative. Total Income: Nirmaya earned a total income of Rs14.7mn in FY13 v/s Rs9.9mn in FY12. The increase in total income can be attributed to 96% Y-o-Y increase in income from corporate sources. The major revenue contributors in FY13 were corporate sources (54%), followed by foreign sources (25%) and Individual local donations (14%). 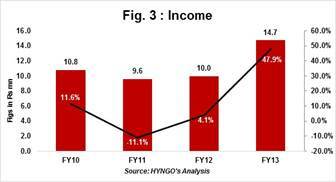 Income from Corporates: During FY13, donations received from corporates totaled to Rs7.9mn, i.e. 2x more than donations received in the previous year from the same source. GlaxoSmithKline increased its allocation to Niramaya from Rs3.6mn in FY12 to Rs6.9mn in FY13. In addition to this, another large donor Glenmark, also doubled its allocation and donated Rs9.9mn in FY13 v/s Rs4.1mn in FY12. Both these pharmaceutical giants influenced Niramaya’s Y-o-Y increase in total income of 48% in FY13. NGOs in the similar space listed with HYNGO, on an average has earned 26% of its total income from corporate sources which is about half the amount earned by Niramaya from the same source of income. Service Charges: In an attempt to build a sustainable model, the organisation from FY13 started charging nominal fees to patients visiting their clinics in Govandi, medical camps held in tribal villages and health sessions conducted at regular intervals in the slums. Contribution from service charges to total income until FY12 was least among other contributors. By activating these initiatives, the organisation earned a total of Rs0.4mn i.e. 3% of total income in FY13. The organisation is optimistic about the increase in income from Service Charges in coming years. Programme Expenses: Total amount spent on direct programme activities increased from Rs7.2mn in FY12 to Rs8.7mn in FY13. Total direct programme expenses include two cost components: a) direct programme cost and b) programme related staff salaries/honorarium cost. During FY13, Niramaya spent Rs1.8mn on organizing and implementing its programmes and Rs6.9mn was paid as professional fees/honorarium to people (doctors) who delivered the programmes. 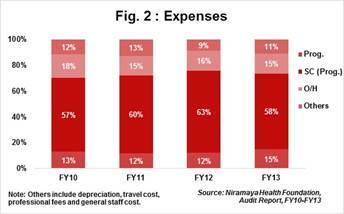 To sum up, Niramaya spent 74% (Rs8.7mn) of its total expenses to carry out direct programme related activities (Refer Fig. 2). 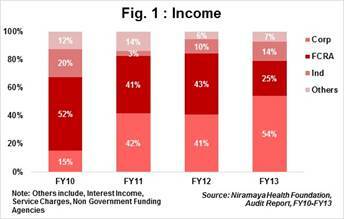 It may be noted that Niramaya has performed better on its total spent on beneficiaries than the sector average of 71% in FY13. Overheads: Rs1.8mn i.e. 15.3% of total expenses was incurred to meet overhead expenses in FY13 (Refer Fig. 2). Niramaya’s spent on overheads was marginally higher than the sector average of 14% in FY13. Niramaya’s continuous efforts to reduce its overheads in past 4 years is evident from its declining trend (18% in FY10 to 15% in FY13). Trust Corpus & General Funds: Niramaya maintains a trust corpus of Rs1.5mn. The trust corpus has remained unchanged since FY10. General Funds at the end of FY13 was Rs6.1mn, increasing from Rs3.3mn in FY12. The increase in general funds is owing to significant surplus (Rs2.8mn) reported in FY13. Surplus in FY13 was the highest in past 5 years. Income Growth Rate (IGR): Nirmaya’s total income has grown at a 5-Year income CAGR of 14% for the period FY09-FY13. The sluggish growth rate was owing to a negative growth rate (-11%) witnessed during FY11 (Refer Fig. 3). The organisation recorded an impressive Y-o-Y income growth rate of 48% in FY13, which suggest that Niramaya made concentrated efforts during FY13 to raise funds from external sources. NGOs listed with us in the healthcare space recorded an average IGR of 23% in FY13. Self Sufficiency Ratio (SSR): SSR indicates an organisation’s ability to meet its expenses from its own income sources. Own income sources include individual donations, income from sales and sponsorship, interest income and service charges. Niramaya’s SSR has been very low since FY10. The average SSR for last 4 years was 12.4%. The low SSR can be attributed to low income from own sources. Income from foreign sources and corporates remained highest for all 4-years v/s other income sources, thus resulting in low SSR. Institutional Donors: Nirmaya has received donations from large donors like Michael and Susan Dell F oundation, AVERT Society, Concern India Foundation and others in the past. At present,Niramaya works closely with Glaxo Smithkline and Glenmark for their CSR projects. 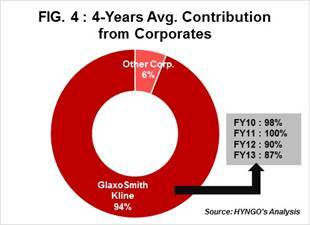 Of all the donors, Glaxo Smithkline’s contribution has been the highest in past 4 years. The organisation maintains cordial relationship with all its donors, which indicates that the donors might consider to extend their support to Niramaya’s upcoming projects in case Niramaya’s liquidity position dampens in future. Dependency: Niramaya’s dependence on corporate sources has increased considerably since FY10. The dependency ratio has gone up from 15% in FY10 to 54% in FY13 (Refer Fig. 1). Delving deeper, within corporate sources, Niramaya is excessively dependent on contribution from GlaxoSmithkline (Refer Fig. 4).The dependency has been as high as 100% in FY11, which suggests that severe disruption in cashflow can occur in case GlaxoSmithkline withdraws its support. In a scenario like this, Niramaya will have to tie up with more corporate houses and revive its old relationships with funding agencies/institutional donors to reduce its vulnerability. In order to reduce the likely vulnerability to external income sources, Niramaya has shifted its focus on developing its own income base by designing a revenue model for its longevity as mentioned above in the ‘service charges’ section. Undesired Retrenchment due to lack of funds: Nirmaya in past few months had to cut down its scale of operations as Pratham Education discontinued providing financial support to Niramaya. Niramaya is grappling with the issue of raising funds on its own with the limited resources. Due to lack of funds, number of Balwadi’s they worked with were slashed down to 50 from 300. The unanticipated tight liquidity position has resulted in declining number of programmes and awareness camps being held throughout the year. Lack of Human Resources: The organisation is currently run by 4 full time employees and 2 project co-ordinators only. With limited human resources, Niramaya is unable to cope up with its expansion plans. Dr. Janaki Desai, Founder & Executive Director is an eminent Gynaecologist and is actively involved in the projects implemented by Niramaya. Besides Dr. Desai, the Board of Directors include 4 other distinguished personalities from the healthcare space. At an operational level, 2 efficient project coordinators manages a team of 30 health workers and an administrative staff with 4 full-time employees. The projects are well managed with all documents and reports in place. Our team had visited the premises and was satisfied with the staff, educative material for beneficiaries and charts devised to track regular health status of every beneficiaries. Monthly meetings are conducted with all health workers and the staff members. The Board meets twice a year and attendance is not yet made mandatory. No directors are related to each other by blood. Niramaya Foundation was conferred with ‘The Best NGO in 2013’ award by Glenmark Foundation. Glenmark Foundation works with 9 other NGOs in India. The organisation is listed with Concern India Foundation and United Way of Mumbai. We strongly feel that the management should formalize the way meetings are currently held. Attendance should be made mandatory for all Directors. By doing this, it will not only bring additional credibility to the organisation, but will also encourage all Directors to get actively involved in resolving challenges faced at an operational level.